PARIS, Nov. 7, 2018 /PRNewswire/ - Fairmont Hotels & Resorts today released key findings from its second Luxury Insights Report. With a focus on Gateway to Home - Hotels as the Heart of their Communities, this latest volume in a series of ongoing research-led, data-driven reports on luxury travel trends, reveals that affluent travelers perceive hotels and resorts as established authorities and trusted travel guides. "Fairmont properties share a special connection to their communities and part of our brand promise is to preserve these diverse and picturesque locations while enhancing their overall welfare," said Sharon Cohen, Vice President, Fairmont Hotels & Resorts. "This guiding principle is inherent to our brand's culture and was the impetus for us undertaking this study to further inform and validate the important role a hotel, specifically a Fairmont property, plays within the local community and how guests, whether abroad or local, perceive them." Fairmont's Luxury Insights Report is based on data uncovered from Fairmont's 2018 Global Luxury Traveler Insights Study, an online survey of 2,725 luxury travelers from France, United States, Canada, United Kingdom, Germany, China, and United Arab Emirates. Industry leaders across the globe – including consumer experience futurists, sustainability strategists, association leaders and travel company presidents – also shared their perspectives on the findings to round out the report and facilitate a discussion around innovation leadership and the integral role of experience in the travel sector. Their insights and perspectives will also be explored further in a new Leaders on Luxury video series, which will feature a mix of Fairmont, AccorHotels and other industry experts commenting on the state of the luxury market. "It comes as no surprise that our latest research uncovered the central role Fairmont hotels play in connecting guests to the local community," added Cohen. "As the Fairmont footprint expands to new markets around the world, we will continue to invest in understanding the motivations of our guests and the local communities in which we operate to ensure we are anticipating their desires and adapting to their needs." Blake Morgan, Customer Experience Futurist"Today's luxury traveler - although not at home - does not want to sacrifice the comforts of home. ""The millennial customer values access over ownership. They crave authentic experiences they can share with their friends and curate the narrative of their digital lives." Costas Christ, Global Sustainability Strategist, Virtuoso Travel Network and Senior Advisor for Sustainable Tourism, National Geographic Travel"Fairmont understands that sustainable travel is not about giving something up; it is about gaining something more – a great vacation that also helps to make the world a better place." "Protection of cultural heritage is a pillar of sustainable tourism, including both the preservation of historic buildings and support for living culture, such as contemporary music, art, dance, and cuisine. Fairmont was founded with a mission to restore, protect and celebrate historical sites and cultural heritage. ""Sustainability is not a trend, it is a transformation of travel as we know it. We are headed to a future where hotel companies that are doing it right are not the exception, but rather the rule, and we have hospitality leaders like Fairmont to help us get there." Anne Dimon, President, Wellness Tourism Association"The luxury of today and tomorrow will also be about having the time, and taking the time, guilt-free, to check-out of the stressful "every day" and allow oneself the "luxury" to not only be free, but just be." Carolyn Kremins, President, Skift"Today "wellness" has been redefined in such a way that travelers look to luxury providers to offer experiences to help them maintain balance. It's no longer enough to offer facilities to manage physical health— wellness is about creating balance between physical, mental, and emotional health." Keith Baron, President, Abercrombie & Kent USA"Multigenerational travel continues to grow as families today are busier and living further away from each other. Travel has become the best way to spend quality time together. ""The very definition of luxury is changing. It is much more about the luxury of experience, rather than just thread count. It's no longer only about having the top suite in a hotel, flying first-class or dining at a Michelin-starred restaurant. It is increasingly about privacy, exclusivity and customization. "Today's most compelling luxury hotels embody the character of a destination through their history and style, combining distinctive architecture with expressive decor and artistry. Each of these hotels is true to its place and its traditions, incorporating elements of the past and reflecting the local culture." Sharon Cohen, Vice President, Fairmont Hotels & Resorts"Fairmont hotels are the heart of their communities, offering immersive experiences that open the door to local culture. Whether it be enjoying a traditional English tea at The Savoy, or embracing a self-care experience at Fairmont Scottsdale Princess, our guests are able to tap into the soul and specific energy of each community." "Travel is an opportunity for growth. Luxury travelers are looking for personal enrichment experiences with a lasting impact that extends beyond their journey. For instance, guests at the Fairmont Mount Kenya Safari Club have the unique opportunity to visit the animal orphanage. Experiencing the rescue and rehabilitation of these animals firsthand creates a memorable connection that lasts a lifetime. ""Fairmont properties are more than just hotels, they are a home away from home – a place to reconnect with family and build new memories." Chris Cahill, Deputy CEO, AccorHotels"Fairmont possesses one of the most celebrated hotel portfolios in the world. The brand's genuine spirit of hospitality is based on its engaging service, which has been cultivated over decades of rigorous hiring practices focused on selecting team members with the inherent qualities that match the behavioral values that the brand is built upon. The result is an emotional connection to the brand that generates loyalty and affection, and which ultimately translates into memorable experiences for guests." Rick Harvey Lam, Senior Vice President, Global Brand Marketing, Luxury, AccorHotels"While rare, it is special when something transcends time to become a symbol of something much larger; Fairmont hotels fall into this territory as they are more than just bricks and mortar, they are these remarkable places full of meaning, fascination and delight, where memories are created." Arnaud Herrmann, Vice President, Sustainable Development, AccorHotels"Fairmont's sustainability programming shares natural alignment with the values of AccorHotels and our Group's Planet 21 program. With a long history and global reputation as an industry leader in sustainable practices, Fairmont continues to explore new avenues in conservation and environmental stewardship, continuously refining operational efficiencies and creating forward-thinking programs to promote ecologically responsible tourism." Matthew D. Upchurch, CTC, Chairman, and CEO, Virtuoso "Over the past two years, our family has embarked on a series of holidays, with the conscious intention of staying at Virtuoso member hotels committed to sustainable practices. Sustainable travel has enhanced each of us individually and as a family – the experiences are deeper and more meaningful, and our children are learning at an early age how their decisions have an impact, both now and in the future. The warm and authentic people, the personal relationships formed with Fairmont staff, and the knowledge that each hotel is committed, from the top down, to the three key pillars of sustainability – celebrating cultures, supporting the economy and protecting the planet – all contribute to helping our boys better understand their place in the world. Traveling with this mindset feels like we're weaving a web of connectedness with people across the world, and the memories created along the way is something our family will treasure for a lifetime. ""This year, I had an incredible weekend with my eight-year old, Benji, at the Fairmont Pacific Rim in Vancouver. Watching him gambol through the lobby to receive a hug from the hotel's general manager, Jens Moeker, sharing a plate of their locally and sustainably sourced sushi and snuggling together to watch a movie in bed at night made this a trip that neither of us will ever forget." About the Luxury Insights ReportGateway to Home – Hotels as the Heart of their Communities is the second Luxury Insights Report volume, offering an in-depth perspective to uncover the motivations of luxury travelers: what connects locals and guests alike to a destination and the importance guests place on how hotels engage with their communities. Fairmont's 2018 Global Luxury Traveler Insights Study was the impetus for developing the brand's second Luxury Insights Report. 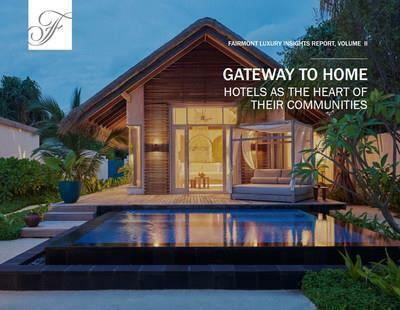 This report builds on the findings from Volume 1 released in 2016 as part of an ongoing series of data-driven reports intended to populate a robust research library for the Fairmont Hotels & Resorts brand. The full report can be downloaded at fairmont.com/promotions/luxuryreports . Luxury Insights Report MethodologyThe Fairmont Luxury Insights Report: Gateway to Home – Hotels as the Heart of their Communities was developed using original research from the Fairmont 2018 Global Luxury Traveler Insights Study, a brand-commissioned 10-minute online survey of 2,725 luxury travelers from around the world. About FairmontFairmont Hotels & Resorts is where occasions are celebrated and history is made. Landmark hotels with unrivalled presence, authentic experiences and unforgettable moments have attracted visitors to Fairmont and its destinations since 1907. The Plaza in New York City, The Savoy in London, Fairmont San Francisco, Fairmont Banff Springs and Fairmont Peace Hotel in Shanghai are but a few of these iconic luxury hotels, forever linked to the special places where they reside. Famous for its engaging service, grand public spaces, locally inspired cuisine and celebrated bars and lounges, Fairmont promises a special brand of thoughtful luxury that will be remembered long after any visit. With a worldwide portfolio of more than 75 hotels, Fairmont also takes great pride in its deep community roots and leadership in sustainability. Fairmont is part of AccorHotels, a world-leading travel and lifestyle group which invites travelers to feel welcome at more than 4,600 hotels, resorts and residences, along with some 10,000 of the finest private homes around the globe.